National Geographic launches a new series on Monday nights titled CHURCH RESCUE. Church Rescue follows “The Church Hoppers”, a team of ministers who specializes in helping struggling sanctuaries get back on their feet. 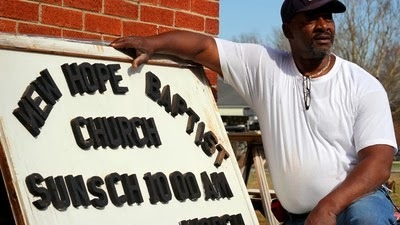 After being contacted by pastors looking for a helping hand, The Church Hoppers dig deep to uncover the church’s problems and then provide them with solutions – a faith lift if you will ☺ Over the course of the first season we’ll get to know The Hoppers as they answer their calling to revitalize churches across America inside and out. The Church Hoppers include Doc, Rev Kev, and Gladamere as a team of ministers looking to help the churches in need. This episode was about a Bapticostal church and Pastor Larry Roseboro. This small country church has the roof deteriorating, water leaking in the basement, carpets rotting. Pastor Larry doesn't want to put anymore money into this church, as his vision is for a new larger church.. though the congregation has no money for it. Pastor Larry is a high spirited, determined man and he gets in the face of the Church Hoppers a little bit. I loved their ways of showing Pastor Larry some things that needed to change, rather than just telling him. Pastor Larry's sermons went for 4 hours!! They were all over the place, no focus, no theme. The Church Hoppers recommended 2 services, an hour each. They also recommended putting into this church building to build up the congregation so perhaps in the future they would have the finances to build a larger church. 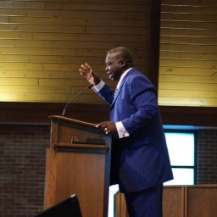 They took Pastor Larry to a larger church building, that was not full of parishoners and talked to the pastor there on how he felt looking out among the pews to see them so empty. Pastor Larry realized he would not like that. The team were able to really get Pastor Larry to focus on bringing the message to his parishioners through an organized, structured message. They did do some landscaping around the church, replaced the carpets inside the church, and did some painting. They also leveled the back yard and planted grass so that the basement would not flood anymore. They also built a small playground for the kids to enjoy, and replaced the 2 haphazard signs with one sign for the church. I loved how they kept some of the preachers message in the show. They did not edit out all faith in it, which was fantastic. It wasn't overly preachy, but it did have a Christian feel to it. I haven't heard of this before, but it sounds interesting. I have not heard about it but will check it out! We hadn't heard of it before this post! Thanks for sharing!